The perfect way to safely and securely segregate MHE and pedestrians from one another. 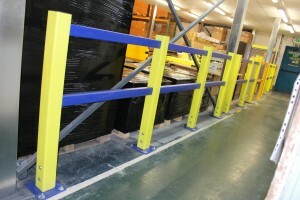 Our pedestrian barriers are available in two or three rail variants depending on the level of protection required. Made from a tough HDPE this barrier variant is extremely resilient and visually striking, aiming in the first instant to be detected rather than hit. When a Standard Pedestrian Barrier isn’t enough, our Single Bumper Pedestrian Barrier pairs functionality with increased strength and protection. The single bumper added to the base of the barrier gives this product an increased durability from forklifts and other MHE, further enhancing safety on your site. 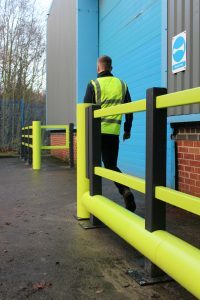 The strongest and most durable pedestrian barrier, the Double Bumper Pedestrian Barrier is perfect for segregating extremely busy MHE areas from pedestrians. 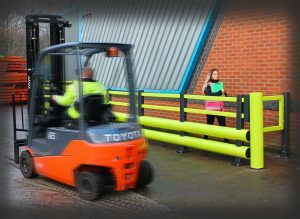 This barrier has the greatest impact strength out of our entire pedestrian range, a must for busy working warehouses who require a safe passage for staff.